Please click here to see the story on their Home Page so that you may visit the links and sign the petitions! Am I surprised at what the animal control officer said about me on tv and the news papers? Yes and no. These are my children, Candace (age 17 at the time), Josh (age 19 at the time) and Parker (age 14 at the time), this photo was taken on 6/17/2011. These kids USED to be happy. These children are now distraught, suffer from post traumatic stress disorder, anxiety and Candace was hospitalized in February due to anxiety and depression brought on by the raid in November. These are the children that you non believers called "victims", the ones you said you "feel so sorry for", these children do admit they are victims, but when you ask them who have abused them they say "BL, the animal control officer and CPS". Just ask them anytime you see them, they'd be more than happy to give you their side of things as NO ONE has ever bothered to ask the children how they feel about having their pets taken from them, murdered and held hostage. No one has bothered to ask the children if they felt they were neglected. No one has bothered to ask the children if they enjoyed running the no kill shelter. The children very much want to be heard, but yet, their pleas to speak falls upon deaf ears because they are "minors". Well Candace will be an adult on Sept 12, 2012 and has the right to voice her side of what happened. Samantha and Randell Lee are the founders of Frisky Felines Foundation A NO Kill Cat Shelter that was started after the Lee's took in several stray cats and realized their county had a problem. They wanted to make a difference in their community so they started a rescue/adoption shelter to help not only cats but families with cats that are in need. On November 17, 2011 the Lee's were raided out of retaliation. This has cost 4 cats their lives, the Lee's have been fighting this case that is based on lies with money that was ear marked for important things for their kids such as braces, college school camp this summer, etc and money for their house to do major repairs that have had to be put off. The children were humiliated by the lies the ACO stated, rumors that began because of the defamation to the point in which Candace (the 17 year old daughter) was hospitalized. 4 cats were murdered at the hands of the ACO because no cats in the Lee's care were ill enough to die! Donors have donated to animal control to take care of the Lee's pets believing they are helping care for ill cats when in fact the cats were healthy and several had recently been seen by a veterinarian. People are complaining as to why they have to take care of the Lee's cats when the Lee's should have to, but the cats were not sick in the Lee's care and the Lee's never received any citation or warning to take care of their pets. The Lee's have since had to legally fight for one of the dog's that animal control wanted the Lee's to either put to sleep or pay $1000 for an exploratory surgery. These animals were not in any harm before leaving the Lee's home, but they have been since being in animal controls care. These animals must be returned to the Lee's, a family that loves them and was caring for them and these senseless seizures and invasion of privacy upon this family that helps others MUST stop! In December 2009, someone living close to the Lee's called CPS on them, on 12/15/09 CPS visited the Lee home, were asked to come to the CPS office on 12/17/09, in which they did, before leaving the caseworker asked them if they'd allow her to open a case on them. The Lee's said no. CPS unsubstantiated the allegations on 12/21/09. The case worker then called in a welfare child check on 1/6/10 (on a family with a closed case). The town marshal from another town lives up the street and of course answered the call. This time, the town Marshal (that had been stalking the Lee's for months was brought in on this (and amazingly is behind the 2011 raid also). The Lee's told the Town Marshal he was not invited into the home because they were trying to clean the basement and they were washing down stuff in the kitchen and they needed to get it finished. The town marshal refused to leave and argued with Samantha that he was going to come into the house, that he was there to check for heat. Samantha told him, "look up you can see and smell the fireplace." He then said he needed to check for hot water. Samantha told him that both he and the caseworker knew that she is disabled and REQUIRED aqua therapy daily in order to be mobile. So heat and hot water were an essential in the Lee household period. He said he didn't care he needed in the house to check on it. Samantha had to stand outside for 50 minutes fighting for her right to privacy because this town marshal would not leave, he even threatened to lock up Randell for a joke he said, remember, this is a neighbor. Samantha was on the phone for 20 minutes arguing with the caseworker that they had no right to be there and they were not coming in and the family was busy. The caseworker told her someone was going to get into that house that night if she had to come out herself, Samantha said she had already offered the town marshal (neighbor to neighbor) to come back in 2-3 hours after they got done what they were doing, he refused that and they were not going to allow him in, they felt he had no right to even be there. The caseworker argued that she'd have someone else to come out, Samantha argued no, they weren't going to stop until they were finished. Samantha who is disabled and cannot be in cold air or talk on the phone long told the case worker she was then in pain and had to get off the phone and going in but was not going to let the town marshal in, the caseworker kept arguing and would not let Samantha off the phone. She kept on Samantha asking Samantha to let her open a case on the family, Samantha said no, so she started again on the town marshal getting into the house. Again Samantha said no, this went on for about another 8 minutes. Finally Samantha near tears in pain told the case worker that she can have the town marshal come back in 2-3 hours after they got done. The case worker said no, he was going to get in then. Samantha said no he isn't he can come back in 2-3 hours but I am hanging up. Then the caseworker said "FINE, but you BETTER let him in and he will be there in TWO hours." Samantha told the caseworker the family would have to stop what they were doing to clean up the kitchen floor, take all the dirty items back down to the basement and cram all the cleaned items in the loft, etc. The caseworker also said, that she would be out the next day to discuss opening a case on the family. Samantha handed the phone to the town marshal, told him to come back in 2 hours and walked into the house. They didn't go in before because they feared what this town marshal would do, they do not trust him. It took Samantha 50 minutes to fight for her right to privacy. On 1/7/10 the case worker said she wasn't coming out because of snow, but asked Samantha if she'd agree to opening a case on the family. Samantha said no. The caseworker said she will discuss it with her when she comes out the following day. On 1/8/10 the case worker said she wasn't coming out because she didn't feel well, but asked Samantha again if she'd agree to opening a case on the family. Again, Samantha said no. The caseworker said she'd see her on Monday and would discuss it then. "we do not agree to an open case, we do not want the states money, we will fund the remodel the way we have been out of our own money". With that the caseworker left. The Lee's felt they finally put things straight with this caseworker. 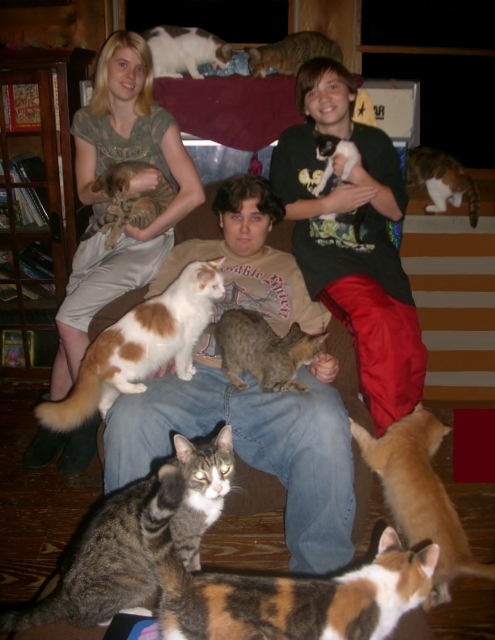 1/12/10 With that the caseworker told her supervisor and the director of CPS that Samantha and Randell were cat hoarders. With that the director told this caseworker (acording to the CPS records obtained by Samantha Lee) to contact animal control. 1/13/10 The caseworker calls Samantha and told her to stay put she was on her way back out to the house, even though Samantha told the caseworker she didn't have time to meet with her, the caseworker refused to listen and made Samantha stop to meet with her. The caseworker arrived at the Lee home with her supervisor and 2 sheriff deputies and told Samantha and Randell they were there to detain the children (without a warrant and without exigent circumstances) and by the way they called animal control and he would be there shortly. The Lee's were dumbfounded as the last thing either of these parents would do would be harm their children or their pets, both are the world to them. They knew something did not make sense but knew that animal control would set this straight. So when the ACO arrived at the home Samantha spoke with him and he stood in the Lee's living room for 20 minutes commending Samantha on a job well done. He questioned her about a few things just to assure her knowledge, in which Samantha picked up on his ill spoken terminology relating to animal care, but dismissed it. As the ACO went to leave he looked over at the caseworker as though to say goodbye and with that his demeanor changed and he said he would be back the following day to seize all the cats. It did not matter that the animals were under veterinary care just 30 days prior, did not matter that Samantha had proof of that, or proof of medication the cats were on, or anything. 1/14/10 The ACO came back and took the cats and coerced Samantha in surrendering Parker's ducks. Fast forward to evidence provided. The ACO stated in his probable cause affidavit to Judge Roger Davis that he saw a cat in a cage with crusty eyes and had an emaciated appearance. Animal Control's veterinarian said this cat weighed 8.8 pounds and that this cat was considered OVERWEIGHT. 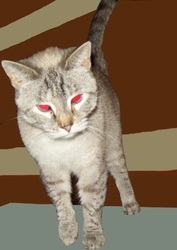 Since the seizure Samantha has discovered ALL 15 cats he illegally seized he killed. His excuse....."Mrs. Lee never returned for the cats so they were put to sleep". This is a lie, Samantha in September 2010 AFTER waiting on the bench warrant that the ACO told her and Randell that would be issued, contacted the investigator and told her that she wanted the cats back. The investigator told Samantha that they were still being used as evidence against her, but would tell the aco. The investigator kept on Samantha wanting to know where her horses were, this was 9 months AFTER the seizure, they could not find the horses and were still looking for them. 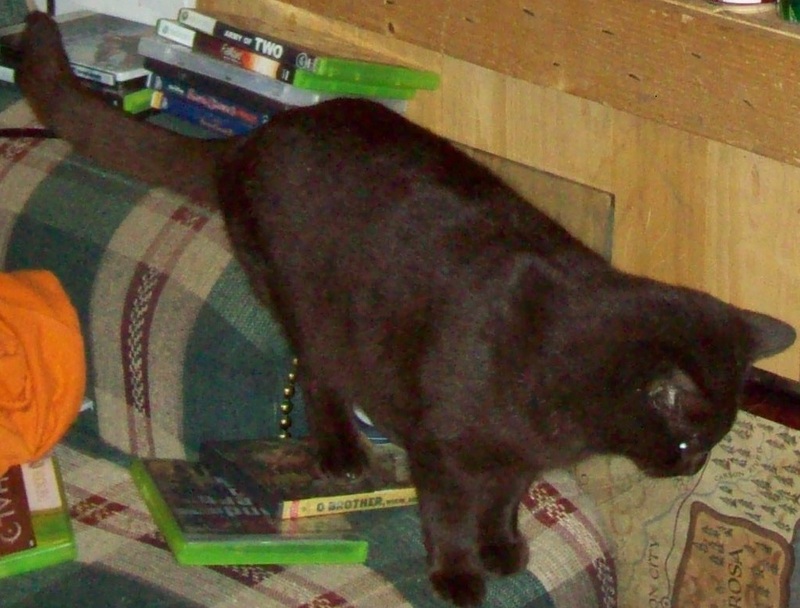 What Samantha didn't know is that the cats were euthanized on 2/1/10. Why? Because no abuse was found, according to state law, they had 90 days to locate the owners of said property before destroying it. In 2011 Samantha filed a tort claim on the ACO for what he did in 2010. He had a duty to realize the cats in the Lee's care were being taken care of especially providing vetting documentation to him. The tort claim was mailed out to Animal Control, Commissioners and County Council on Feb 28, 2011. The parties had 90 days to respond, no response meant the Lee's had the right to sue. 10/28/11 the Lee's horses were stolen by the Harrison County Sheriff's department and have been at a rescue since then. The sheriff's department stated the horses were at large, however they broke into a locked barn, the fence was cut and told Samantha she would probably be charged with something over the horses, Samantha told the Sheriff she didn't see how since she did not believe that the horses were out but that someone let them out. It was found out later that the Sheriff (same sheriff that was part of the 2010 incident) said the horse rescue cut the fence, the horse rescue told Samantha they were never on her property and that the mounted sheriff patrol brought the horses to the horse rescue. The Prosecutor saw no problem with the horses, just asked the Lee's to make the paddock bigger, however, this was October, the weather was not feasible to move a fence but the Lee's were trying. (In February 2012 the prosecutor asked the Lee's to surrdender the horses to the horse rescue. Samantha told the attorney that she tried to do that back in November after the raid because with fighting to get the animals back and protect the kids she didn't have time for the horses and the horse rescue refused, but Samantha did surrender them in February. In March the prosecutor asked Samantha to take the horses back. However, the Lee's could not take the horses back because of the raid, they lost the property the horses were at). The horse rescue is now saying the Lee's owe $9000+ on horses that the prosecutor asked the Lee's if they would surrender to the horse rescue so the rescue could adopt out to recoup their losses. November 16, 2011 Samantha Lee went to get 2 feral cats from a lady begging her for help (this lady was referred to Samantha, Samantha did not seek this person out like the ACO has tried to make the public believe), stating if Samantha did not take these cats that she would be evicted. Samantha is a very compassionate person and tries to help people, since the cats were feral she said she would help because the cats would not be part of Frisky Felines Foundation as Samantha told this woman she was full and could not take anymore, but would help her since they weren't coming to the rescue and would put them with a feral colony. November 17, 2011 before noon the sheriff's department was on the Lee's porch. Everyone that has heard the ENTIRE story believes the Lee's were set up to get these feral cats to be raided. NOTHING was ever stated as to as to why the ACO seized ALL the pets on the property, except that this lady that Samantha helped had a complaint on the condition of the house. (A house that no address was listed for, an address that is not on Samantha's business card, and the reason there has not been an address listed for the rescue is because the Lee's were remodeling their home during which it was not set up for visitors and to prevent drop offs), how did this lady get the Lee's address????? The Lee home was a mess, something Samantha has never denied, BUT the house was a mess for VERY good reasons and I will state those here for you to clear up any rumors you may have heard or will hear. 1) In September the basement flooded, had 8 inches of water in it, then the sump pump broke and what water they could get out just came right back in. The Lee's went to get another sump pump and they could not get the type needed for their basement. Eventually they did get the correct sump pump but things had gotten worse in the basement to the point that the beginning of October Samantha and Randell MADE their nearly 19 year old son move out of his basement bedroom until they could get all the water logged items outside and burned/tossed. Which was a task in itself. It has been reported that Samantha made her 17 year old daughter, another report says minor child sleep in this water logged room as late as November, that is not true, that is why the basement looked the way it did, NO ONE was using the basement since Oct 1, it was being emptied out due to the mildew, everything was water logged and was going to be burned, but you can't burn wet things nor is it safe to walk on the floor with water because of the cement. This is an UNFINISHED basement. It has a concrete floor and concrete walls. Josh (who is the oldest child) moved to the living room. Josh is a typical teen age boy and is not the cleanest unless he wants something from his parents then he is amazingly neat. Which Samantha and Randell feel is a typical kid. From moving Josh to the living room the living room then became smaller, crowded and consisted of things the living room didn't have before which all belonged to Josh. In order to get Josh's "bedroom" in the living room Samantha had to take down her office and turn it into a sitting room to house the living room furniture, so Samantha had to condense the office (which is upstairs in the loft) to another part of the house. This meant purging items and getting rid of things that they no longer wanted, etc. They had to move decorations around to utilize attic space better which is why Halloween things were out. Josh also asked Samantha if he could take over the kitchen (he wants to be a chef), Samantha knew not to do that, but Josh promised to keep up with it all and keep it clean. So the living room and 1/2 of the kitchen was then Josh's responsibility. With this, Josh as a typical kid enjoyed making the mess when cooking but never wanted to clean up afterward and Samantha like a typical mother had to get on him over and over. 2) On Nov 5, 2011 (Saturday) The family took Samantha out to celebrate her birthday. Come home and worked some in the basement. 3) On Nov 6, 2011 (Sunday) Samantha came down with a stomach virus that lasted for 6 days. The family had started the process to get things ready for Thanksgiving, they put up Christmas decorations on Thanksgiving evening and wanted to get as much of the basement cleaned up as well as the few areas they were trying to remodel done. They would bring things up from the basement on weekends and Samantha and the kids would clean it and put it away then start the process over until they got the basement emptied. 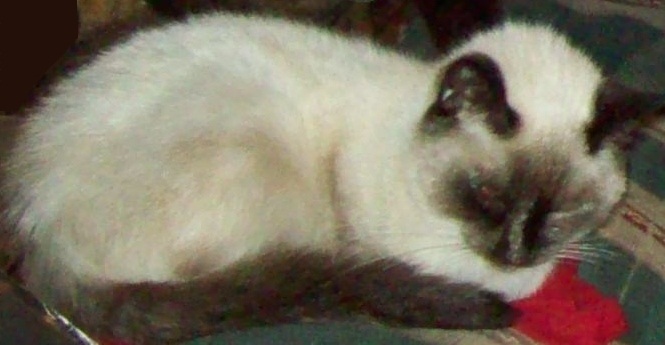 4) On Nov 7, 2011 (Monday) Samantha had to take Parker's cat Gizmo to the vet for cosmetic surgery and Speck an adoption cat for a check up. This vet that Samantha uses is a 1 1/2 drive one way from the home. Samantha really did not feel like going but Gizmo had only a few days window to get the surgery, so she went. Samantha also is disabled and driving that far did her in just on her disability alone, not to mention the feeling being nauseated while driving. When she got home she laid down in hopes of feeling better the next day. 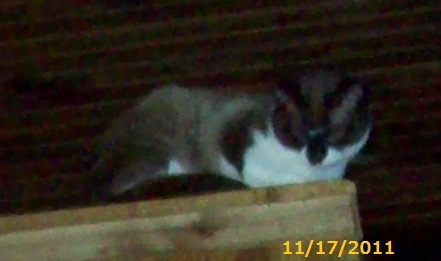 5) On Nov 8, 2011 (Tuesday) Not feeling any better, she called the vet and had Gizmo stay another night. Samantha though didn't feel well did some of the things that needed done but was not up to par to doing them all. 6) Nov 9, 2011 (Wednesday) feeling a little better but not great Samantha went back out to get Gizmo. Once Samantha and Gizmo got home, not feeling well Samantha laid down for a bit and did a tad bit of this and that around the house. 7) On Nov 10, 2011 (Thursday) feeling a little better Samantha started cleaning some more. Candace was cleaning their bathroom and their bathroom walls had mildew on it (not mold as the media reported) and Candace was wiping the walls down (the mildew was on the glue from where they took the wall paper off in order to paint the walls. The mildew came not from lack of ventilation as stated in reports but due to the door being shut after showers and the fan for the vent not being turned on, it was also reported this bathroom had no ventilation and it does.) Samantha told Candace to stop wiping the walls down until she went to to the store to get facemasks. (CPS has a photo where you can see the wall was being wiped down), but these parents are being charged for having mildew on the bathroom walls because Samantha halted cleaning that until face masks were available, they'd rather the family clean it than take safety precautions. They were cleaning the walls to be able to have the bathroom fixed up for guest on Thanksgiving. 8) On Nov 11, 2011 (Friday) The family had started working on getting more of the basement dried up and emptied out from all the waterlogged items in the basement. It was a slow process to get this done due to Josh's bedroom being in the basement and 3/4 of the basement being used for storage. Everything was either getting ruined or got ruined due to the sump pump breaking and they not being able to find a sump pump back in September. There was dilapidated cardboard that had floated for a while that disintegrated to mush, blankets that Josh had laid on the floor that were hopeless of being salvaged so sat there to be drained to be moved outside that started growing fungus, but by this date they were still way to heavy to pull up and out, so the family was cleaning the items that were more accessible waiting for the bigger, wetter items to continue draining. Josh had been complaining about his stomach bothering him. Samantha assumed he had gotten the same stomach virus she had. So he started laying around not able to do much like Samantha did the week before.9) On Nov 12, 2011 (Saturday) The family was trying to get everything washed up and stored away. There were clothes hampers of stuffed animals brought up, Josh's items out of his room, the stored canned goods, the furniture that still needed to be moved upstairs, etc. All of the items from the basement were placed in the living room and in the kitchen. Some of Josh's items were on the living room chairs. The items that were ready to be thrown in the washer (that they were trying to save) were on the kitchen floor which consisted of a dog bed, a pillow case and a rag all from the basement, a jacket and pair of shorts) there were other items in clothes hampers that were to be washed in the washer and other various things needing somewhere to go were setting out. Josh was still feeling off and was not helping as much due to feeling nauseated. 10) On Nov 13, 2011 (Sunday) was rolled over cleaning from Saturday. Josh was off and on with not feeling well. The family kept going through things. Kept on the same routine of getting ready for Thanksgiving. They brought more things up to be washed in the bathroom, some of it was on the floor, etc. Samantha did not mop the kitchen floor, living room floor, or the kids bathroom floor because they never got finished and was waiting to mop once that part of what they were doing was finished. Kenya, an adoption cat started acted odd and Samantha had planned on taking her to the vet the following day. 11) On Nov 14, 2011 (Monday) at 6 am Josh woke Samantha up and asked her to take him to the ER. Samantha told him he was on his 6th day and Samantha told him just to stay home from school and try to sleep it off, he'd be fine as hers lasted 6 days. Josh insisted to go to the ER so Samantha got up and took him. After Josh was released (with a diagnosis of a stomach virus) she took Kenya to the vet. Kenya was diagnosed with an upper respiratory infection and was put on Clavamox. Samantha spent that night tending to Josh and Kenya and trying to get the house back in order as they were trying to get everything done as thanksgiving was just next week and they had guest coming and wanted to put the Christmas decorations up prior while leaving some for the tradition for the family. The goal at this point was stopping on the basement, getting everything brought up, cleaned and put away, then work on general housework so they could paint Saturday, get the rooms arranged the way they needed to be to do any minor adjustments after the house was back to normal. 12) On Nov 15, 2011 (Tuesday) Samantha had a long day the following day and she had to "precooperate" to prepare for that due to her disability. During this the lady about the feral cats called crying to Samantha about if she does not take the cats she is going to be evicted. Samantha told her she had way too much going on with her own cat and didn't really have time. The lady pleaded with Samantha that she'd be evicted and the cats are being shot at by the neighbor. So Samantha told her since she had to go to her town the next day she'd swing by and get them. (There is a big part of this meeting getting this cats that is not listed here). Samantha had Josh to go to the basement and clean up his room and throw out things that were ruined of his and bring up any dishes and get them washed. Josh brought up the dishes but sat them on the counter and in the sink and didn't wash them up. 13) Nov 16, 2011 (Wednesday) Samantha waited for the vet to call about Kenya's blood work. She called and Samantha told the vet that Chargheera and Mufasa had started with sneezing and coughing, but Kenya was doing better, but didn't bounce back as quickly as Samantha felt she should had. Samantha asked the vet if she could give Mufasa and chargheera their own Clavamox. The vet said "legally I can't give them their own Clavamox but I can give Kenya a refill and ok that you give it to those 2 cats and any cat that gets it." Samantha then stated "since these 2 are getting it, chances are the whole kennel will get it, what should I do at this point?". The vet then told her "I can order you L Lysine and you can give that to all of them and hopefully that will ward off some of them from getting it........." So Samantha ordered the L Lysine for the shelter and the vet told Samantha to come up and get another bottle of Clavamox and start Chargheera and Mufasa on it and gave Kenya another prescription in additon to her Clavamox. So Samantha left the house to get Josh at school to take him to his other school, had to stop at the animal hospital, while at the animal hospital she spoke with the vet tech and asked if she knew of any local feral colonies that were being maintained as she was not going to be keeping the cats she was getting but was going to put them with a feral colony, drop Josh off, head to get the cats she was going to help and then headed out to see how much it was going to cost to get her van fixed. Then after wrapping up her errands, Samantha picked up Josh and headed home. Samantha got home and discovered Candace and Parker did not do their chores. This made Samantha mad as there was so much that needed done by Friday night. Samantha did not want to wake Candace because of school, so she punished them instead of doing their chores for them, she left them to do the next day after school with additonal chores. If it wasn't holiday coming up she would had grounded them from their friends like she normally does. 14) Nov 17, 2011 (Thursday) Samantha got up to get a head start on getting the house back in order and since she punished Candace and Parker she was trying to get her chores out of the way so she could help the kids get the house back in order, Samantha and Randell soon learned they were being staked out. The 2 dogs (Brownie and Coal) were stolen based on the ACO saying he could see Coal's spine and ribs from a distance, implying that Coal was emaciated, but the state veterinarian stated that Coal was of average weight. Then months later the ACO made this comment about Coal and I quote... "I would consider him to be of average weight when I got him". So there are 2 statements and 2 witnesses saying that Coal was not emaciated as he stated to get an ok to seize the dogs while waiting on the seizure warrant. The search and seizure warrant was based on Coal being emaciated and that they also saw emaciated cats and cats with upper respiratory infections. There were ONLY 3 sick cats and NONE of those had an active URI, Kenya got sick on that Sunday, Chargheera that Tuesday and Mufasa that Wednesday, the raid happened the following day that Thursday! I would like to know why the state vet reports that 21 cats scored a 1-2 on the bcs, which says they were emaciated. I had a few overweight cats. How can NO cat on the bcs not score a 6 if they were overweight??? The state vet said, when she examined the cats that NONE of the cats were of average weight. I want answers as to HOW none of the cats were of average weight when I have pictures from CPS that were taken the day of the raid that show 3 overweight cats in their own photos!!!! It is rumored that there was feces all over the floors, on the kids beds, on the table, counters, etc. That is a lie, yes, there was SOME feces in the house, it was generalized by the back door which was by a litter box and another litter box. A couple of cats were being treated for coccidea and had loose stools. The aco and the cops both testified that "these cats had it coming out of both ends", and that is a lie. ( Actually this is the same statement stated in the paperwork in the 2010 illegal seizure.) They say the poo was old and that is a lie also, I checked the floors before I went to bed the night before the raid (by the litter boxes) because I wanted to make sure the litter boxes didn't need to be scooped before I went to bed, because if they did the cats may go outside of the boxes before I got up in the morning, that is Parker's job to maintain the main floor litter boxes, there was some poo in the boxes but not very much for that many cats, there was enough room and fresh litter available in the boxes. They are saying the litter boxes weren't touched in weeks or months, however, Parker just washed, sanitized and refilled the litter boxes that Monday evening, you can see the fresh litter in the photos. The reason there was feces there is because we were staked out for 5 hours and I could not tend to the main floor at all. Not to mention when they came in the house they didn't "walk" through the house, they were skipping around, flying about like they were giddy children. The cats were freaking out and I have never seen my cats act like that. First the cats were all calm, laying around, but then started running about the house. It was really sad to not be able to comfort them, I think most of them knew what was going on. The floors were marked up for tracking the water from the basement throughout the house and coming in and out of the back door. That pretty much describes what happened. Was the house a mess, yes, would a simple, clean it up suffice, yes, were the animals generally in good health, yes, did anything warrant a seizure, no! As a matter of fact the house was clean within 24 hours. The rest of the time was spent trying to protect the kids and cats. The ACO is out to destroy Samantha and has already defamed her on TV and to the news papers, why? Is it because she filed a complaint and now it may be found out what he has done and possibly is doing to other people and how for no reason he is killing HEALTHY animals that STILL LEGALLY belong to people? Does he want to give her such a bad name that no one will believe her once she speaks the truth to the community of how he is hurting innocent animals? Is it because she is standing up for her family's civil rights? When asked what his job consists of he stated and I quote "seizures, impounds and helping the sheriffs department build criminal cases." Really? Since when does an ACO's job consist of seizures and helping build criminal cases? What happened to issuing citations/warnings that is LISTED in the Harrison County Ordinance? These people behind this illegal seizure need to be fired and put in jail for child and animal abuse as the accusers are the abusers. 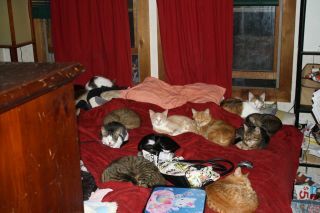 These are pix of the cats taken during the raid, tell me, do they look neglected, malnourished or sick? Please donate to help us see this through. We have an attorney ready to take over the lawsuit we filed against CPS and animal control. He needs a minimum of $7000. The judge has been working with me on raising the funds, but he has given me a final date of July 11, 2012 to have my attorney to file an appearance and to file an answer to the defendants motion to dismiss. IF I do not have these things done, the judge said he will rule on the matter WITHOUT a hearing, so the case will be dismissed. Please do not let any of these people walk, each person we are suing are responsible in some shape or form for the MURDER of our cats, the mental abuse upon our children and then because they did nothing when I filed the complaint the animal control officer then retaliated against me and did it again, please, do not let them get by with it. I want BL, the animal control officer REMOVED from his position! 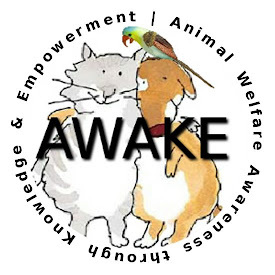 Please help us make that happen, that will hopefully help other animals. What do you get out of helping me?? Well, for one, I am mad as heck and I will be lobbying for new laws, yeah, everyone says that will never happen, that is probably what they said about Ambers Law, etc. I will fight for it until it happens. Secondly, IF we win this lawsuit for what we are asking we will be putting up a fund to help those wrongly affected by CPS, Animal Control, or the liking to be able to fight back and sue. In my opinion that is what is wrong with this country, no one can financially fight it or they are too scared due to retaliation, I mean, seriously, I stood my ground, now I am facing criminal charges because of it. Let my present not be your future. Please donate anything you can, please share this page, please get the word out. Please for the love of the animals of this world, do something to help us stop it.